CHINAPLAS 2015 , four new high-tech theme zones apart from 11 traditional theme zones will be added to address the latest emerging demands of China market, said the organizer, Adsale Exhibition Services Ltd.
Fueled by gradually accelerating transformation and upgrade of China’s economy, sophisticated technologies, precision equipment and high-performance materials are in high demand. In recent years, the Chinese enterprises have faced various issues including labor shortages and rising labor costs, leading many companies to consider introducing automated production lines in attempts to reduce production costs and enhance product quality. The Chinese government has rolled out a wide range of policies in support of the economic transformation and lends its support to the industrial robot industry since 2012. The Ministry of Industry and Information Technology of China (MIIT) is reportedly taking the lead to formulate the Technology Route Map of China Robots and the 13th Five-Year-Plan for the Robot Industry. A recent report published by the International Federation of Robotics (IFR) indicated that China has become the world’s largest consumer of industrial robots. It is expected the demands of high-end automation technologies used in modern manufacturing industry will continue to rise. 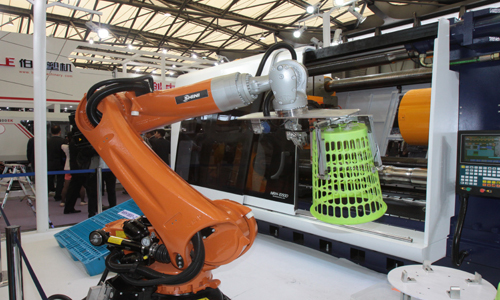 Therefore, CHINAPLAS 2015 will see the establishment of the Industrial Automation Zone. “In the past, various automation technologies were scattered over different theme zones. The setup of this new zone is to tame the growing demands for automation in local market. This new theme zone will serve as a one-stop destination for visitors to learn about the latest automation technologies from all over the world and can watch live demonstrations of robotic systems as well,” explained Ada Leung, General Manager of Adsale. In recent years, the development of high tech industry and high added value products have made many high performance materials, composites and specialty plastics come into the fore. As a result, the Composite &amp; High-performance Materials Zone will officially make its debut at CHINAPLAS 2015. Automotive and aerospace consume most of the composites and high performance plastics as manufacturers look for materials with light weight construction and high strength that significantly reduce weight and enhance fuel efficiency. With a gradual growth in pigments, masterbatch and additives industries, Color Pigment and Masterbatch Zone and Additives Zone will be set up as two individual main theme zones rather than the sub-zones as in the last year in a bid to provide more targeted and efficient exhibition platforms of related products and technologies to visitors.